This direct, very lively, and inspiring teaching is a part of this book about St. Seraphim and gives in a very few pages the very purpose of our life in the Church: the acquisition of the Holy Spirit. 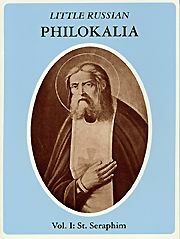 “Philokalia” means “love of the beautiful and good”. It was the name given to a celebrated 18th-century collection of Greek mystical texts on the Christian spiritual life, teaching the path to true sobriety and the fullness of union with God. This “Little Russian Philokalia” is a new collection of ascetic texts drawn from Russian sources, chiefly of the 18th through the 20th centuries. The first volume is devoted to St. Seraphim of Sarov (1756-1833), one of Russia’s best-loved saints, a heavenly man overflowing with Christ-like love, to whom the mysteries of the other world were open. He taught that the main aim of Christian life is to acquire for oneself the Spirit of God. His amazing and supernatural conversation with N. A. Motovilov on “The Acquisition of the Holy Spirit” is included in this volume. Softbound. 158 pp.